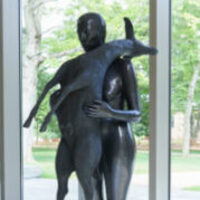 Join Gund Gallery Associate Paris Tully ‘21 in a discussion of Kiki Smith’s "Her" (2004), on view in the Gund Gallery’s Fischman Lobby, and the artist’s "The Vitreous Body" (2000), a recent acquisition donated by Jewish Chaplain and Director of Spiritual and Religious Life Marc Bragin in honor of his father Steve Bragin. Image: Kiki Smith (American, b. 1954) Her, 2004. Patinated Bronze, edition of 3, number 3 (silver nitrate). 70 x 36 x 18 inches. Gund Gallery Collection; gift of Mr. and Mrs. Graham Gund ’63.